"He's got the temperament of a cat." 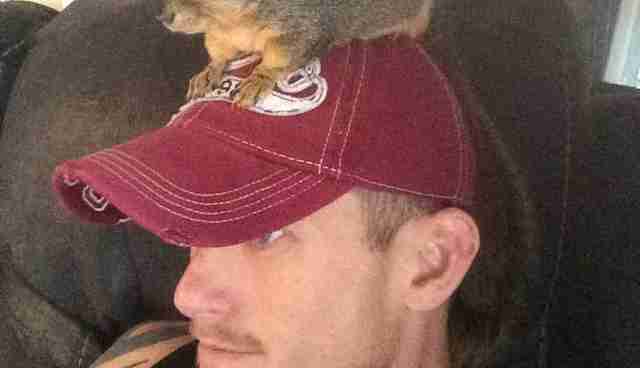 Allen Pursley was the last person who wanted a baby squirrel. And definitely not in the house. 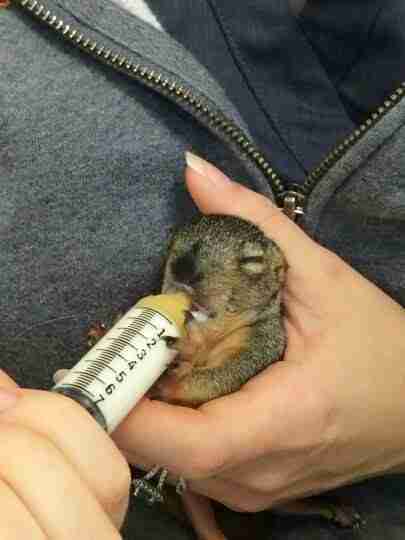 But the tiny orphaned animal needed someone desperately. 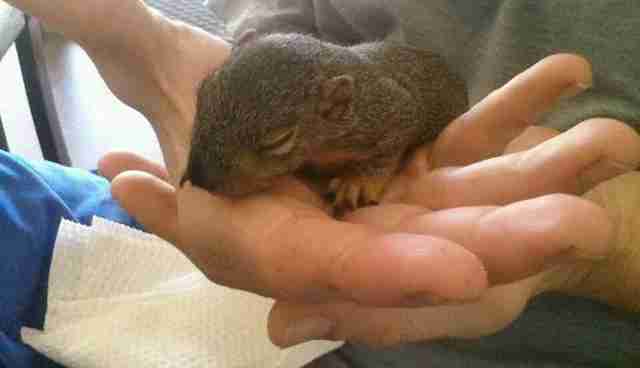 Before his eyes had even opened, the little squirrel had fallen from a tree. 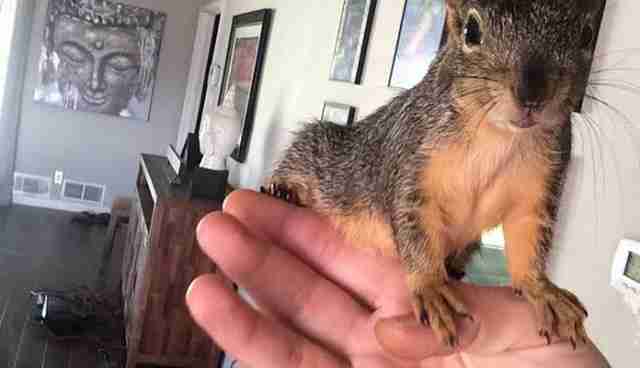 Pursley's husband, who works at a veterinary clinic in north Texas, took the baby home to heal before he could be released back into the wild. The thing is, Pursley works from home, so he spent his days alone with the newborn animal. And that animal needed to be hand-fed his nourishing milk. And when he opened his eyes for the first time, all he saw was Pursely. "Then I started spending a lot of time with him," Pursley tells The Dodo. "Before the week was up, I was already converting our closet into a space for him." 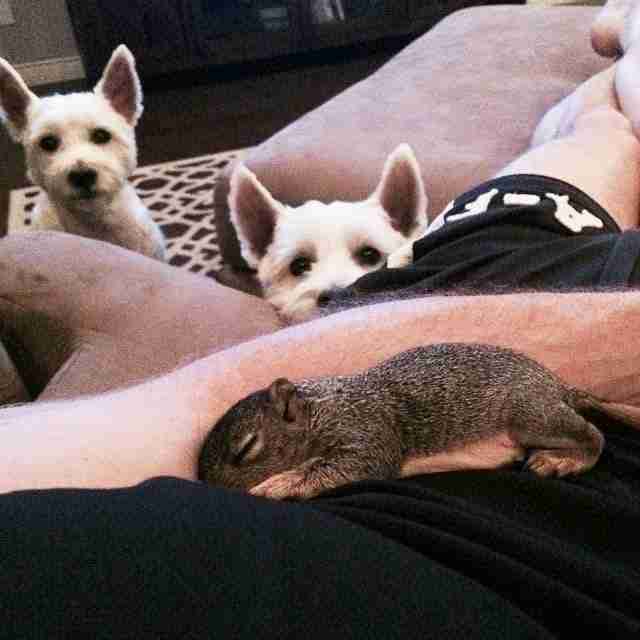 At first, the squirrel was named Rocky. But Pursley found himself using another name a lot. 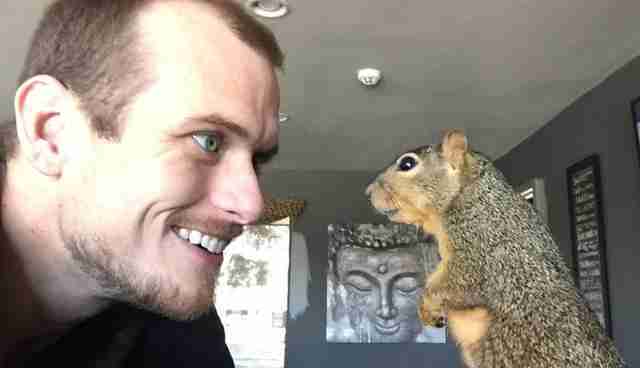 "I'm sure he also thinks his name is 'Bad Squirrel' with as many times as he heard me say it when I was training him to stay off countertops and drapes," he says. When you love someone, you come up with all sorts of extra names. So he wasn't just Rocky. But also Bad Squirrel. And Squirellito .. Sweet Squirrel ... Squiggidy-Boo. Somewhere along the way, however, Pursley made a mistake. Sweet Squirrel was supposed to be wild squirrel. He was supposed to return to his own kind. But Pursley had waited too long to release him. "I didn't know what I was doing in the beginning," Pursley recalls. "We were just basically trying to keep him alive. "By the time he ended up becoming an adult and I looked at releasing him," he says, "I realized I had already done way too much wrong to be able to release him." 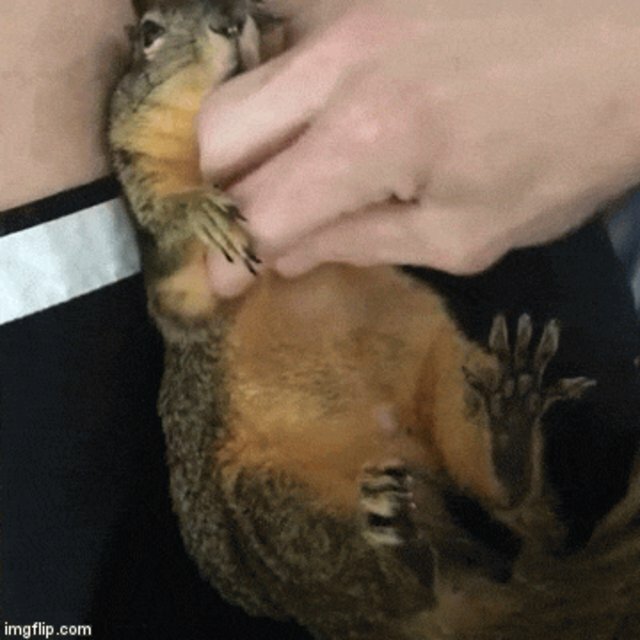 This squirrel was simply too tame to survive in the wild. There was a moment when Rocky was running amok in the house after another squirrel appeared at the window. Rocky stared out at his country cousin for an instant. 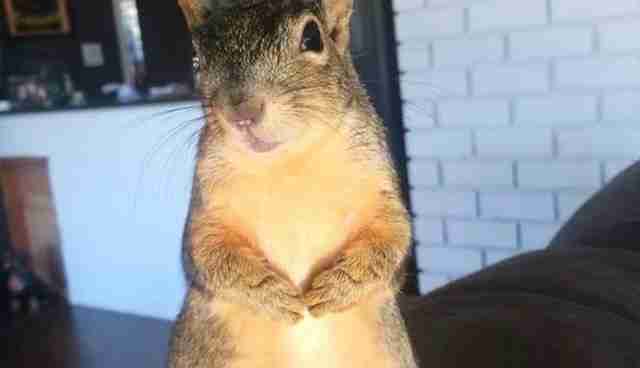 It seemed like an invitation to rejoin the squirrel kingdom, where, of course, all squirrels belong. But Rocky brushed off his country counterpart and stayed true to the man who saved him. 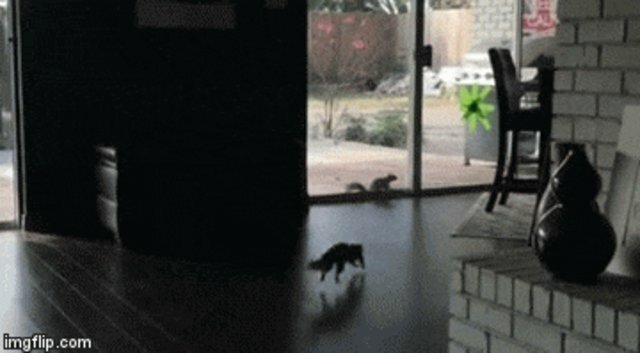 While there are other animals in the house - a couple of dogs and a cat - Bad Squirrel tends to play a little too rough for them. "He doesn't allow anybody else to handle him," Pursley says. "My husband can't handle him either." With Pursley, on the other hand, "he's got the temperament of a cat." 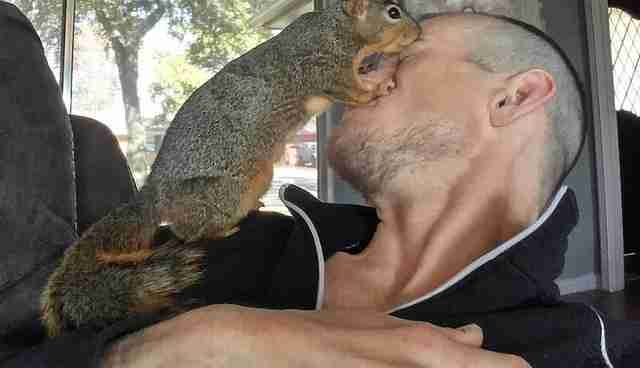 Today, two years after moving in with his human, Rocky or Bad Squirrel or Squirrelito still shows no desire to leave. For his part, Pursley is building him a home outside, hoping at least to give the animal some options in his new life. But Rocky is the kind of squirrel who makes his own decisions. And for now, at least, he's decided his place is right here. 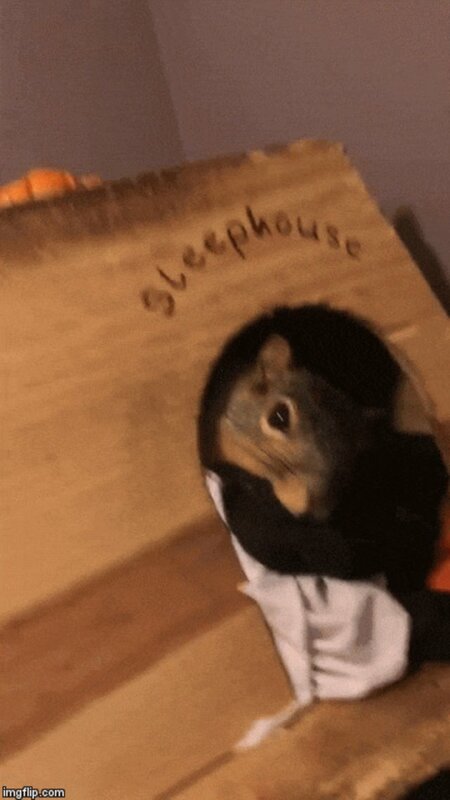 We don't recommend keeping a squirrel at home. Even if some of them don't seem to want to leave. Here's what you can do to help get orphaned animals back on their feet - and back into the wild. If you would like to follow Rocky's ongoing adventures, check out Pursley's Instagram page.